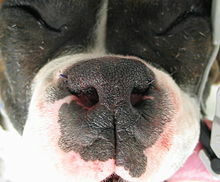 Stenotic nares is part of the brachycephalic syndrome of short-nosed dogs. Breeds such as Boxers, Bulldogs, King Charles Spaniels, Pugs, Boston Terriers, Shih Tzus, Lhasa Apsos, etc. are all considered brachycephalic breeds. Stenotic nares means the nostrils are pinched or narrow. This makes it more difficult to breathe and causes snorting and snoring in these animals. It is a congenital trait; these animals are born with it. Veterinarians perform a simple surgery to help widen the nares, often at the same time as a spay or neuter. Stenotic nares, elongated soft palate, and everted laryngeal saccules, are components of the brachycephalic airway obstructive syndrome. Laser ablation - CO2 laser repair of the stenotic nares is bloodless, allowing a clear view of the surgical field and more precise surgical incisions. ^ a b Core, Daniel (2014-04-02). "Laser Bloodless Repair of Stenotic Nares". Aesculight. Retrieved 2017-02-06. ^ KEATS, M. M. (2012). Brachycephalic airway syndrome, Part 1: Correcting stenotic nares. DVM: The Newsmagazine Of Veterinary Medicine, 43(4), 6S-8S.